Cut a hole in your wall for the pipe thimble. If you are using 3-inch pipe, make the hole 7 1/4 inches in diameter. If you are using 4-inch pipe, make the hole 8 1/4 inches. Insert the thimble in the wall. Line up the stove with the hole, keeping it 1 foot away from the wall. Put a section of double-wall pipe through the thimble. Apply a line of high temperature silicone around the stove exhaust, about 1/2 inch from the back wall of the stove. Pull the double-wall pipe onto the exhaust pipe just until the double-wall pipe meets the silicone. Do not push the pipe completely onto the exhaust pipe, otherwise you will not be able to remove it later. Move the stove 3 inches closer to the wall. On the outside of the house, attach a tee with a bottom clean-out on the end of the pipe. Insert a vertical pipe section into the top of the tee. The pipe should run at least 3 feet vertically, or high enough to extend past any possible snowdrift. Attach the pipe to the house using support brackets every 4 feet. Put a 90-degree elbow at the top of the pipe, followed by the vent cap. The end of the pipe should be at least 12 inches from the house. Seal all joints with high-temperature silicone, including the thimble joints on the inside and outside of the house. Cut a hole in your wall for the pipe thimble. If you are using 3-inch pipe, make the hole 7 1/4 inches in diameter. If you are using 4-inch pipe, make the hole 8 1/4 inches. Insert the thimble in the wall. Line up the stove with the hole, keeping it 1 foot away from the wall. Put a section of double-wall pipe through the thimble. Apply a line of high temperature silicone around the stove exhaust, about 1/2 inch from the back wall of the stove. Pull the double-wall pipe onto the exhaust pipe just until the double-wall pipe meets the silicone. Do not push the pipe completely onto the exhaust pipe, otherwise you will not be able to remove it later. Move the stove 3 inches closer to the wall. On the outside of the house, attach a tee with a bottom clean-out on the end of the pipe. Insert a vertical pipe section into the top of the tee. The pipe should run at least 3 feet vertically, or high enough to extend past any possible snowdrift. Attach the pipe to the house using support brackets every 4 feet. Put a 90-degree elbow at the top of the pipe, followed by the vent cap. The end of the pipe should be at least 12 inches from the house. Seal all joints with high-temperature silicone, including the thimble joints on the inside and outside of the house. Install the pipes in the same manner when venting through the roof. The only difference is that your clean-out tee must be inside the house. You will need to install a fire-stop spacer in the ceiling and a storm collar and roof flashing on the roof. Buy those parts as a set along with your pipe, and follow the manufacturer's installation instructions. If your vent will run higher than 15 feet, you have to use 4-inch diameter pipe. If you can't run the pipe straight up, use 45-degree instead of 90-degree elbows to adjust the pipe run. If you are installing your stove into a fireplace, use flexible stainless steel pipe to get the vent past the smoke shelf inside the chimney. Extend the vent out of the chimney and attach a storm collar and rain cap. Cover either the top or bottom of the chimney with a cover plate, then seal the cover plate joint with silicone. Use only noncombustible pipe at least 2 inches in diameter for the fresh air intake--never use PVC pipe. Cut a hole in the wall to fit the pipe diameter, then run the pipe from the stove intake to the outside. Finish the pipe with a 90-degree elbow or a wind hood. Cover the end of the pipe with wire mesh to keep small animals out. 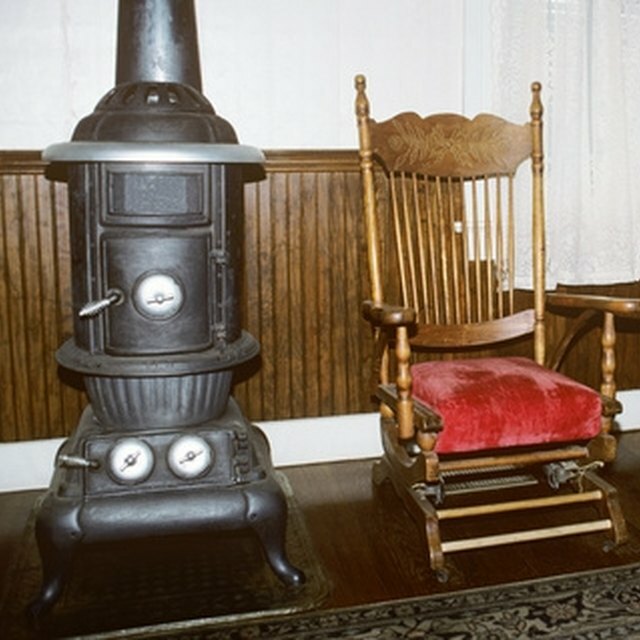 If you are installing your stove in a fireplace, you may run the air intake pipe either through the top of the chimney or through the ash clean-out.